300,000 model gives around 5 years of use, but it’s not available everywhere. Learn more in the review. An effortless Glide design, light-weight wand and simple controls mean it’s very comfortable to use. Proven safe and effective on dark and black skin, and works on fair hair. It’s faster on the lower intensity levels, where a full leg takes around 10 mins, but slower if used on the higher intensity levels. Better suited to darker skin. Customer service team is knowledgeable and responsive, the pre-sales information is ok.
Mixed online feedback that I think is down to poor promotion by Iluminage and QVCUK. Learn more in the review. Expensive, unique technology for which you’ll pay a premium. Offers are becoming more common. 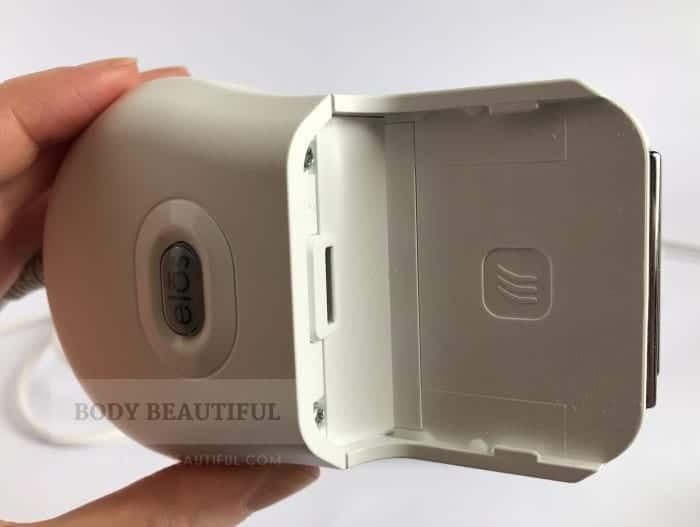 The Iluminage Touch is manufactured by Iluminage Ltd (formerly Syneron Beauty Ltd), and it’s the rebranded next-generation version of the Me My Elos devices. You can use it on both body and face (below cheekbones). The Touch has CE certification to meet EU safety standards. It also has FDA clearance. You can buy it in the UK, Europe and the USA. You can use it on all skin tones from light and mid to dark brown, brownish black and darker skin tones (Fitzpatrick skin types I to VI). You can use it on black, dark brown, brown, dark blonde, light blonde and red hair. You’ll need more treatments to see results on blonde and red hair. Although no white or grey hair was tested in the clinical trials, Iluminage say it should work. You can use it on freckled skin too, but you can’t use it on very large freckles, birthmarks and moles or over tattoos and varicose veins. First available in 2016, it works with combined energy of Radio Frequency and Intense Pulsed Light. This gentle energy is branded Elōs energy. It slows and reduces hair regrowth after each session, and eventually stops your hair growing back at all. Periodic use keeps you smooth. This same technology is gentler than regular IPL so you can use it on the darkest skin tones. It’s also proven to work on fair hair. You can learn more in the full review. The UK and Europe model comes with 300,000 flashes and 120,000 flashes in the USA. You’ll need 7 weekly treatments (taking 6 weeks) to see significant hair reduction results. Then top-up treatments as required (starting monthly). You’ll need more treatments on fair hair as it takes longer to see results. The Iluminage Touch system is specially designed and proven safe for dark and black skin. The Elos energy emits gentle IPL and Radio Frequency so it won’t hurt or burn. The 5 year lamp lifetime, large flash window and facial adaptor make it the best choice for full body and face treatments on dark skin tones. It also works on fair hair, but you must wax, epilate or pluck the hair immediately before use.The epilator attachment is a bonus. Results take longer to see, but it does work. 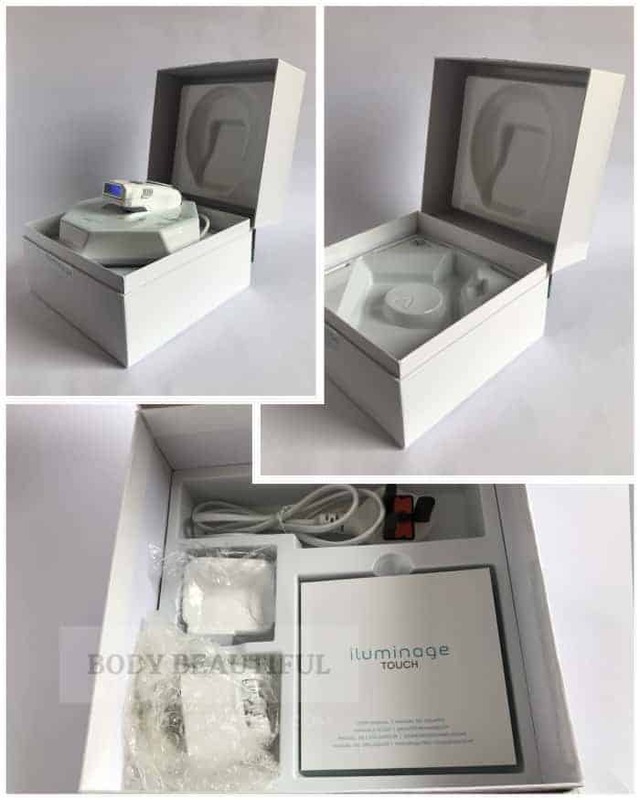 The Iluminage Touch is the one to choose for full body and face treatments if you have dark skin because it’s designed especially for you and it’s safe. It’s clinically proven safe and effective, and cleared by the FDA too. The slightly dated design (with a base unit and wand) is still very comfortable to use and it’s fast on the lower intensity levels suitable for the darkest skin. It’s the only machine clinically proven to work on fair hair (blonde and red) too. But you’ll need more than the advertised 7 weeks to see results. The Iluminage Touch wins my Best Buy award for full body and face treatments on dark skin and fair hair. Or keep reading this Iluminage Touch review to learn more about how it works and what results you can expect on fair hair. What does permanent really mean? How does it work on darker skin and what is Elōs energy? 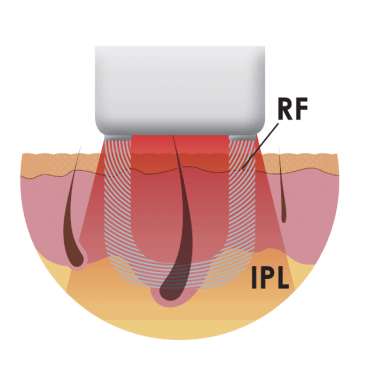 IPL targets the concentrated dark pigment (melanin) in the hair follicle. 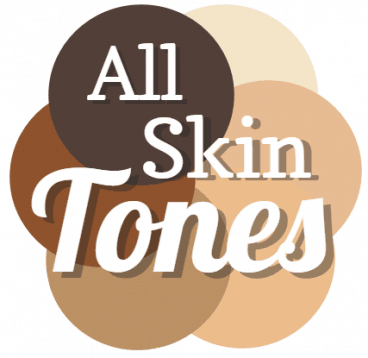 Melanin is also present in the skin and there’s more of it in darker skin tones. This makes IPL unsafe to use on darker skin. To solve this problem the Iluminage Touch uses a combination of Intense Pulsed Light (IPL) and Radio Frequency (RF) energies (named Elōs energy). Illustration of the Intense Pulsed Light (IPL) and Radio Frequency (RF) energies used in the Iluminage Touch. 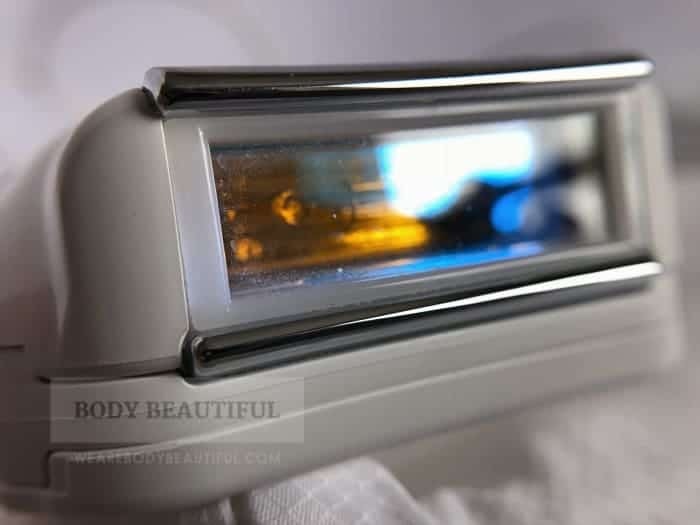 This combination means the Iluminage Touch uses a gentler, lower energy Intense Pulsed Light (IPL) that’s safe and effective for ALL skin tones. These energies work together to heat the hair shaft and follicle, damaging it and reducing hair growth. 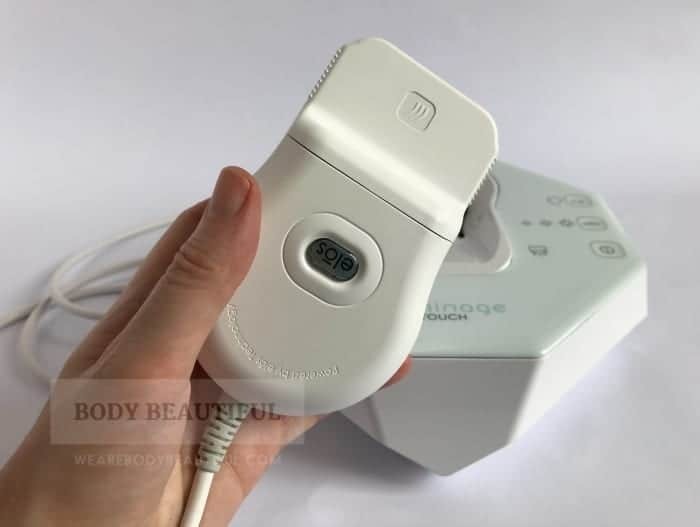 This combination means the Iluminage Touch uses a gentler, lower energy intense pulsed light (IPL) that’s safe and effective for all skin tones. Elōs energy reduces to possibility of skin sensitivity and reactions on all skin tones too. You can also treat lighter hair colours (blonde and red) if you epilate or wax immediately before use. The Elōs energy focuses on the small amount of blood left in the follicle after it’s pulled out, this heats up which then damages the follicle to disable it. The lower IPL energy also means the bulb flash repetition is fast, and instead of one flash per area of skin you’ll need 2 or 3. Is the Iluminage Touch good value? 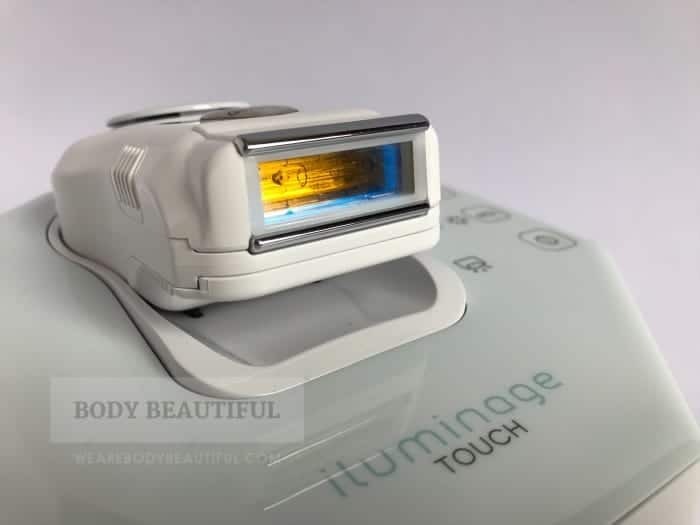 The Iluminage Touch 300,000 provides good value for money with plenty treatments. 300,000 flashes combined with the 3 cm2 body treatment window means you can treat a total body area of 396,000 cm2, or 100 full body applications for 5 years of use. The 120,000 model is more readily available in the USA. It offers 154,400 cm2 and 2 years of use. You can buy replacement bulbs to extend the lamp lifetime with another 120,000 flashes at around $150. Let’s start with the UK and Europe version first. With the Iluminage Touch you must flash each area of skin 2 to 3 times, vs once with other IPL machines. This is because of the gentler, reduced intensity IPL energy. Let’s assume we’ll flash our skin twice over. You get a minimum of 300,000 flashes and the treatment window is 3.3 cm². So, with this model you can cover a total body area of 396,000 cm². That’s the same as about 100 full body treatments (full legs, bikini line, underarms and face). It’s enough for the start-up phase and monthly top-up treatments lasting just over 5 years. That’s great value. Onto the 120,000 model available in the USA. It has the same treatment window size at 3 cm². And with the 120,000 flashes you can cover a total body area of 158,400 cm². That’s 40 full body treatments to last up to 2 years of treatments. That’s lower than other premium machines and less than I’d recommend. The value isn’t as good as the UK version here. I hope Iluminage will soon make the 300,000 model available in the USA. But if not soon, I guess it’s not the end of the world. You can pick up a great value replacement cartridge. In the US they come with 120,000 flashes and cost about $150. So, you can continue treatments without needing to buy an entirely new machine (costing $445). Read onto learn how the Iluminage Touch impresses me. What’s it like to use the Iluminage Touch? The Iluminage Touch arrives in a small, attractive, understated white and pale blue box. The packaging is small and neat, the colours cool and understated. What stands out is the key messaging “Permanent, Safe, Fast”. Keep reading the full review for important information on permanency of hair reduction results. The box sleeve concisely describes the Touch uses Elos energy and so it’s the only home use IPL safe for all skins tones. 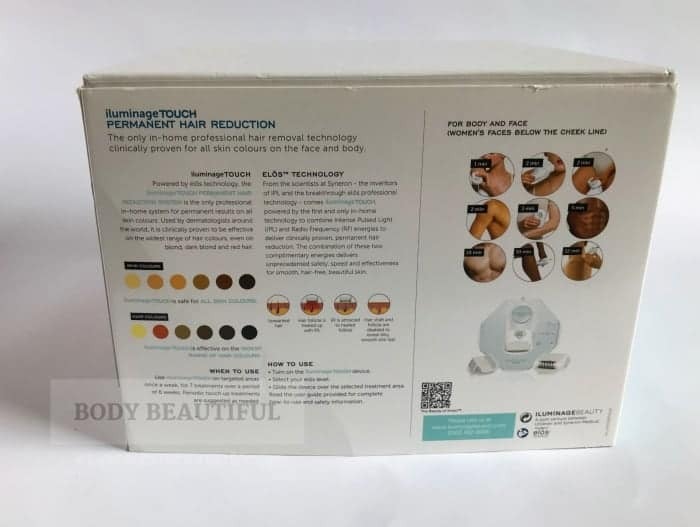 The box also explains it’s effective on the ‘widest range of hair colours’ but it doesn’t explain you must epilate / wax or that results will take longer to see. Small photos show the body areas you can use it on and how long each area should take. Below the sleeve is a clean simple box embossed with an Iluminage logo. Lift the lid to see the compact mains-powered base-unit with a corded hand-held applicator. The lid lifts open and back to reveal the compact Iluminage Touch device. The packaging is well designed so everything fits in layers in the box and is easily accessible. Below the white plastic bed is another tray with neat compartments for the power cable, facial attachment, epilator adaptor, instruction boklet and goggles. It’s well designed and a pleasure to open. The contents of the box: Touch device, small instruction booklet, goggles, facial adaptor, epilator attachment, mains plug. The machine is styled in clean crisp white and is professional looking. A pastel, pale blue, mirror-like surface on the base unit and matching applicator badge, adds a touch of class. The controls on top of the base unit are simple and clearly laid out next to applicator cradled in the centre. The Iluminage Touch is a compact, understated, professional looking machine. Clean lines, simple controls and a cool pale blue surface make it both tactile and sophisticated. The small applicator sits securely in the cradle with the cord wrapped neatly around the base unit. It’s compact – smaller than I expected. Although a slightly dated design of base unti and applicator, it looks and feels good. A thick flexible cord that doesn’t tangle attaches the white applicator to the base unit. 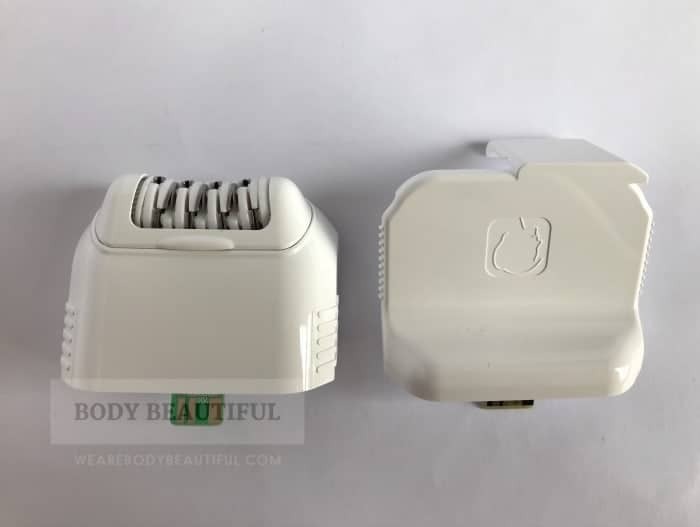 The applicator is about the size of an electric epilator. It’s light weight and extremely comfortable to hold. The handheld applicator is about the size of an epilator and a similar shape. The lines and angles fit comfortably in your palm. The flexible cord is fixed securely in the base, the flash window is easy to gauge and the full width of the business end so it’s accurate to position. There’s a small Iluminage Touch badge on the side too. Or keep reading to learn just how easy it is to use. First read the user manual. Start with the warnings section to check for reason you shouldn’t use the device that apply to you such as pregnancy, pacemakers, sunburn, skin conditions and medicines related to photosensitivity. 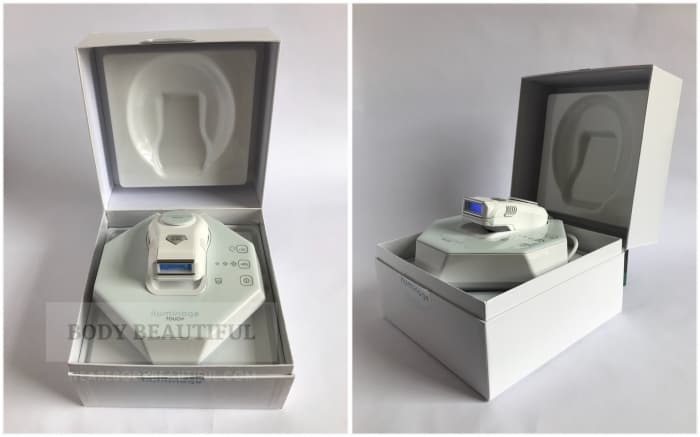 The manual introduces you to the device with helpful diagrams, outlines your skin sensitivity test, how to use it, indicative treatment times, the treatment regimen, cleaning, storage, replacing the flash cartridge, troubleshooting common problems, warranty and specifications. It is clear, comprehensive, easy to read and well laid out. There’s no skin tone chart with suggested energy intensity levels. You work out which intensity level to use during your skin test. As with all home laser and IPL devices it’s important to follow the guidelines on tanning and sun exposure. Unfortunately, the guidelines from Iluminage are very vague. The manual simply says you shouldn’t tan immediately before or after use. After checking with Iluminage Beauty they advise to stay out of the sun for 2 weeks before a treatment, and to avoid the sun and tanning for 2 weeks after your treatment. There’s more on tanning and sun exposure here. For best results on dark hair, shave before your treatments. As you progress through your treatments the need to shave becomes less until you may not need to anymore. Be sure to still complete the full treatment regimen. For best results on light hair (light blonde, red and grey) wax or epilate before your treatments. Waxing and epilating causes a small bit of blood to form in the hair follicle. The Elōs energy targets this blood during the first treatment and, because the blood stays in the follicle, it can target it again for the subsequent treatments. During the treatment regimen you should epilate or wax away any new hair that grows before each treatment. Please note: The Iluminage Beauty support team confirmed that on light hair, you will require more than the 7 weekly to see best results. It’s frustrating this isn’t made clear in the user manual or on the website, and Iluminage Beauty could do a much better job at setting expectations here. Please be prepared that perseverance and patience is key to getting good results. After prepping your skin, select a small area of skin for each body part you will treat. Start at LOW and flash your skin. If that’s comfortable move to another spot and flash at MEDIUM. And if that’s ok, repeat on a new spot at HIGH. Wait 30 minutes and check for any reaction. If your skin is clear use the highest level that is comfortable and do your full treatment. Shave if you have darker hair, or wax / epiliate for lighter hair. You can shave, wax or epilate when treating the face. Make sure your skin is clean and dry. Set up the system and turn it on. When the orange light turns green select your Elōs intensity level, press the activation button on the back of the applicator so it turns blue and the fan starts. It won’t flash until its on your skin. Place the applicator with the contact bars squarely on your skin and bright light pulses will flash. Glide the applicator over your skin until you have covered the area, it will continue to flash with complete skin contact (no need to keep the button pressed). Then start again and retreat the same area. Repeat this 2 to 3 times in total. If not in use for 30 seconds the applicator will turn itself off. Press the activation button on the applicator to turn it on again. If not used for 3 minutes the device will go into standby. Simply press the power button to turn it back on. 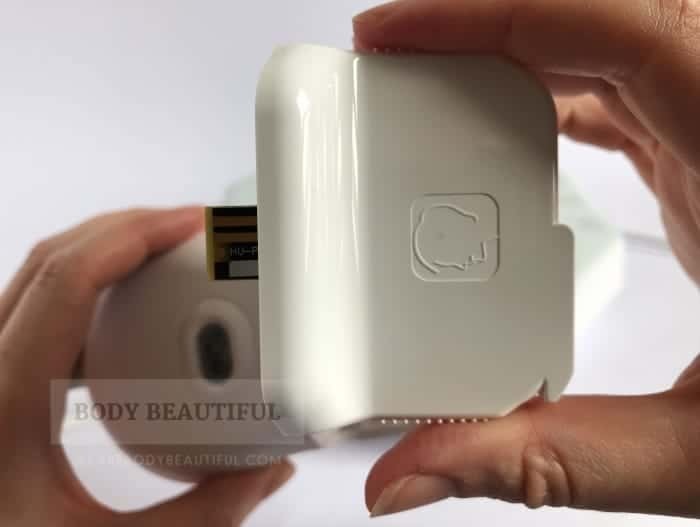 There’s no skin tone sensor because the device is very gentle and safe for all skin tones. Start with the LOW intensity level and only move up if it’s comfortable. This way there’s very little risk of feeling any pain during your treatment. Like the other devices, the Iluminage Touch has a safety system to prevent accidental flashes. The RF sensors protect your eyes by ensuring you can’t accidentally flash into open air. Your skin must be in contact with the full length of both bars. The RF bars also control the continuiuty of the flashes. As long as they’re in contact with your skin the flashes will keep coming. No need to press a button each time. Simple. Two silver RF bars at the top and bottom of the treatment window must be in full contact with your skin before it will flash. But these RF bars have a further clever use. They control the continuity of flashes too. This makes the Iluminage Touch exceptionally simple to operate. First, you press the small Elōs activation button on the applicator and then simply position it where you want it on your skin. The RF bars sense your skin and keep the flashes coming. You can glide it for continuous flashes over your skin. Or lift it off in a stamping action so it flashes each time it touches your skin. Unlike all other devices, there’s no flash button to continuously press during the treatment. There’s one mode that reacts based on how you position the device. This is comfirtable. There’s no stress and strain on your grip from keeping a button pressed in. You can shift it however you like or even swap hands without any break in operation. The applicator stays active for 30 seconds so, if you do briefly break contact with your skin, the flashes will start again once the RF bars are back in contact. And, on the lowest setting, the flashes are fast which makes it even more effortless. It’s very comfortable and easy to manoeuvre. It’s simple and intuitive. It’s different when using the precision attachment. More on that below. The hand-held applicator is light and it’s easy to manoeuvre too because of the long flexible cord. You can roughly gauge where the light exit window is, but getting painstaking and precise coverage isn’t such a big deal as it is with other devices. This is down to the ease of operation described above, and the fact you must cover each area with 2 or 3 non-consecutive flashes. So getting precise overlap of the device is not as important because you pass over the area multiple times. The lightweight applicator fits comfortably in the palm of your hand. The long flexible cord doesn’t weigh it down and it’s easy to manoeuvre. Press the small ‘elos’ button on the back to activate the flashes. It glows blue when they’re activated. It’ll only flash when the RF bars are covered by your skin. TIP: For full coverage on difficult to treat areas (e.g. underarms) move the applicator in two directions; left/right and up/down. 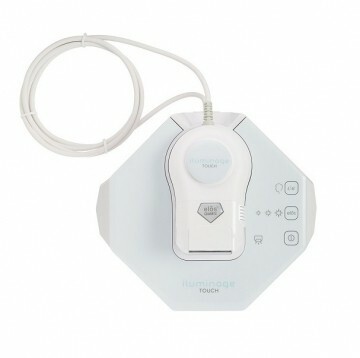 The Iluminage Touch comes with 2 accessory attachments; a precision and an epilator attachments. 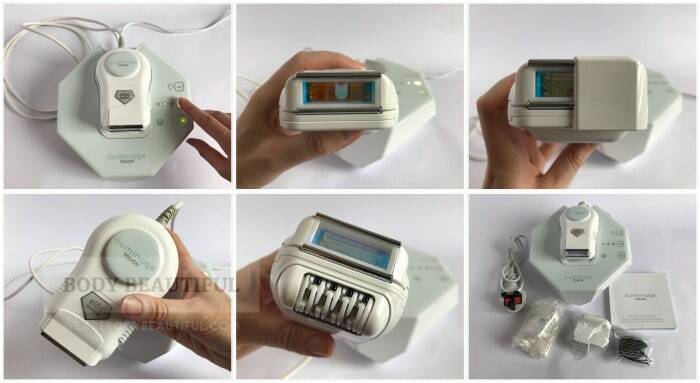 The epilator attachement and the facial adaptor that come with the Iluminage Touch system. They’re easy to attach. With the power off, remove the attachment protective cap next to the activation button. To use the attachments, look at the back of the handheld applicator for the 3 hairs logo. This is the protective cover. Ease it away from the elos button and it slides off. This is underneath the protective cap. You can see the grooves and slot for the attachments to slide into. You can then replace with the epilator or facial attachment. The facial attchment has small ridges on the side to give your fingers grip when positioning it. You can see a small chip at the end which slides into the applicator. The attachments slide into place next to the flash cartridge. The attachments simply slide and click into position next to the treatment window. Note, the flash cartridge stays in place. The small precision attachment sits over the treatment window and reduces the size of the flash area to 2 cm2. This makes it easier to treat your face. When using this attachment it emits only 1 flash at a time, so you need to reposition the window and press the activation button each time. This is so you always carefully position the window around sensitive areas like the lips. The small precision attachment slides over the treatment window and reduces the size of the flash area to 2 cm2 providing more accuracy. You need to press the elos flash activation button each time you want a flash. There’s an epilator attachment too. You must use this if you have fair hair. This sits beside the flash window and allows you to epilate ahead of the flashes. Press the accessory activation button once for low speed, or twice for high speed. Once the epilator attachment is in place you select the speed with the top button on the base unit. There are 2 speeds. Look for the button with the 3 small hairs on it. Press it once for slow and twice for fast. The epilator starts whirring! Press it again to reset. Then choose your elos level and off you go. You might like the sound of this if you epilate quickly. Personally, I find epilation is slow going (and torturous), much slower than the speed of the Iluminage Touch treatments. If you prefer you can wax or epilate before using the device. ensure your skin is clean before flashing. Reaching some areas is tricky, like the backs of your knees and upper legs, and involves twisting and turning in front of a mirror. The power-cord is long enough and easy to work with once you find the best way to reach all the necessary areas. I prefer holding the applicator sidewards and working in rings around the contour of my legs. That way it’s easier to keep track of where I’ve flashed. 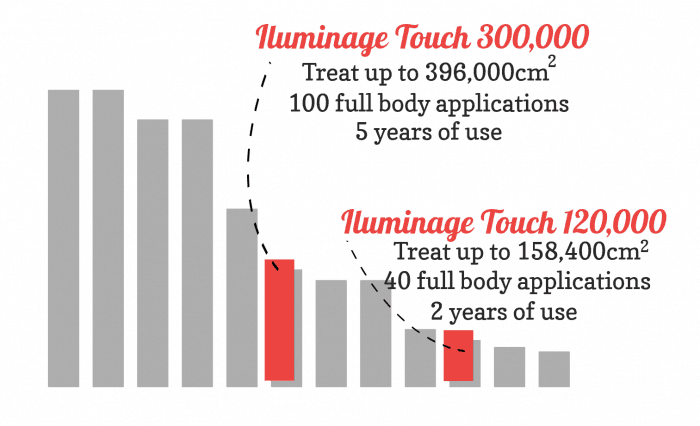 How quick are the treatments with the Iluminage Touch? The Iluminage Touch has a 3.3cm² treatment window and it flashes every 0.9 to 1.9 seconds, depending on the intensity level used. Assuming you flash each area between 2 or 3 times as instructed it’ll take you between 1:20 to 3:00 minutes to cover a pair of underarms (an area roughly 120 cm²). The flash window is 3.3 cm² and on the lowest intensity the flashes are fast at every 0.9 seconds. You flash each area 2 to 3 times so you can do a full leg from around 10 minutes. Tthe lower intensity levels are designed for darker skin so that’s good speed of application if you’ll use the lower levels on dark skin tones. If you have fair skin and use level 3, the flashes are every 1.9 seconds. You still flash each area 2 to 3 times so it’ll be slower for you. Iluminage say it takes 10 minutes per full leg. This is probably true if you use a lower intensity level. User feedback says it takes longer than this on the higher intensity levels. So treatment times are variable. If you have darker skin and use it on the lower intensity settings it’s good. But if you have paler skin and can use it on the highest setting it’s going to be slower and faster options are available. You get a standard 2 year manufacturer warranty from Iluminage Beauty and they give good customer support too. You can contact them with questions through an online form (telephone support would be an improvement) and in my experience they respond quickly within 24 hours. 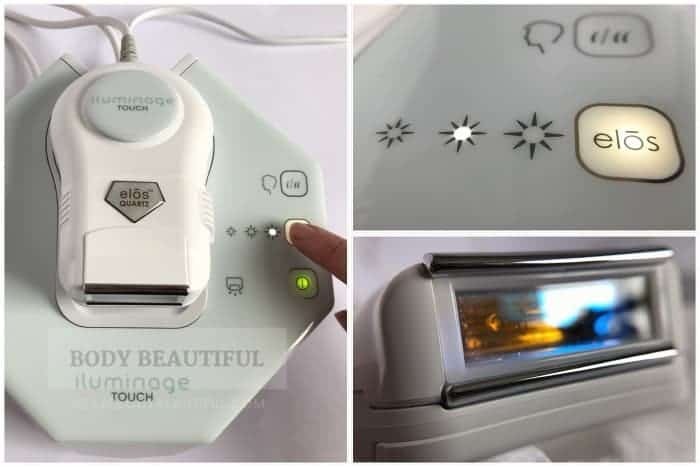 Iluminage Beauty could provide much better pre-sales information such as user manual downloads, more about E lōsenergy and set clearer expectations on results for users with light hair (I hope I’ve clarified it in this review). There are several uses of the attention-grabbing word ‘permanent’ on the Iluminage Touch packaging, in the user manual and on the website. The box shows “permanent hair reduction” in 3 places but I can’t find anywhere that it is actually explained. And it’s important to have realistic expectations. When I see this phrase, I think once I’m done with the start up phase I’ll never need it again. I can throw away my razor and I’ll be forever hair free! But it’s misleading because it’s not the full picture. You’ll still need periodic top-ups to stay smooth. You can find out more about the permanency of IPL here. 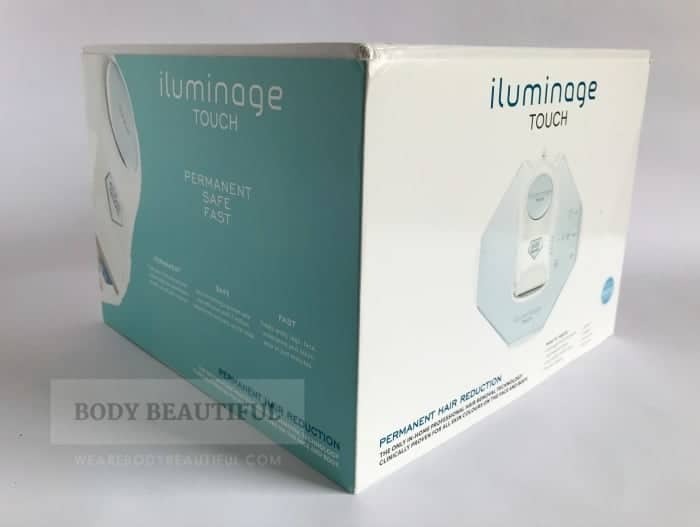 What do the online Iluminage Touch reviews say? The overall score for the Iluminage Touch is a good 3.8 stars. This is collated from all the online Iluminage Touch reviews. It’s reassuring there are zero reports of faulty devices. But there are lots of low ratings from QVCUK users. Iluminage Beauty used QVCUK to promote the device in 2016. I think it backfired a bit. Read on to learn why. Some reviewers report it’s very time consuming and it takes much longer than the suggested treatment times on the highest intensity setting. Quite a few explain problems fitting the attachments , finding them “counter intuitive”. But other reviewers (having read the user manual) explain the attachments work with the flash bulb and not in place of it. The attachments are easy to attach once you read the instructions (or check the photos above). The facial adaptor covers part of the flash window to create a smaller flash area for more precise flashes . The epilator atachment sits below the flash window. It passes over your hairs ahead of the flash window so you can epilate and IPL at the same time. There are many low ratings from QVCUK users saying they haven’t seen results. This is in contrast to reviews for the Iluminage Precise Touch and Boots.com where only a handful reported it didn’t work for them. Why is this? I suspect the high number of critical reviews from QVCUK shoppers is in part down to the TV demo. Here they heavily promoted it to use on light hair but didn’t set clear expectations. They didn’t caveat that you’d likely need more than the advertised 7 weekly treatments, because it takes longer to see results on light hair. Iluminage shared this information during my research. It’s noteworthy the Iluminage Precise Touch doesn’t suffer this negative feedback (it wasn’t featured on QVCUK). Iluminage Beauty could do a better job at setting expectations here, especially as it is the only device of its kind to work on fair / light hair. If you have fair hair be aware you’ll need more than the suggested 7 weekly treatments to see results. It could take several weeks longer. In fact, 2 reviewers with blonde hair reported no results after around 3 months of treatments. 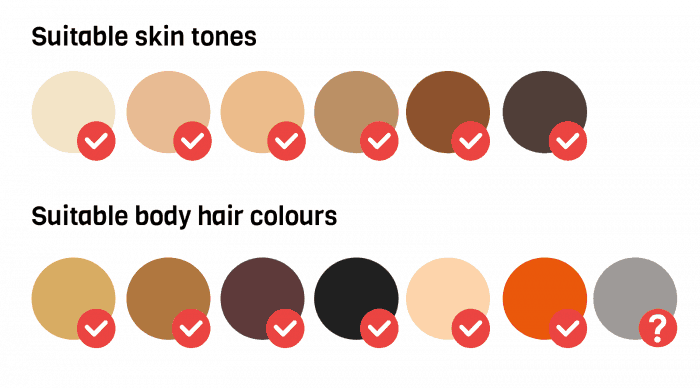 Not all QVCUK reviewers note their hair colour, but at least 10 are from users with fair hair (blonde, auburn, red, white and grey) and who epilate first. Most tried for at least the 7 weekly treatments, but it’s unlikely that’s long enough. The’re also a few QVCUK reviewers who say it’s hard to tell if and when you have hair reduction after waxing / epilating pre-treatment because you’ve already taken the hair out at the root. This is interesting and shows that results are harder to detect compared to shaving pre-treatment. Another handful also report no results after a few treatments, saying there’s no difference in their usual post waxing / epilating regrowth. This reinforces that light hair needs longer to see results than the suggested time frame and that results are less obvious than with shaving. There are just a handful of low ratings from Boots.com users. 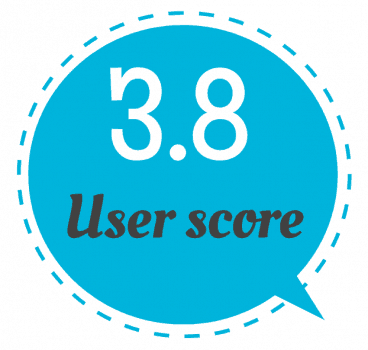 The majority of these customers left overwhelmingly positive reviews. 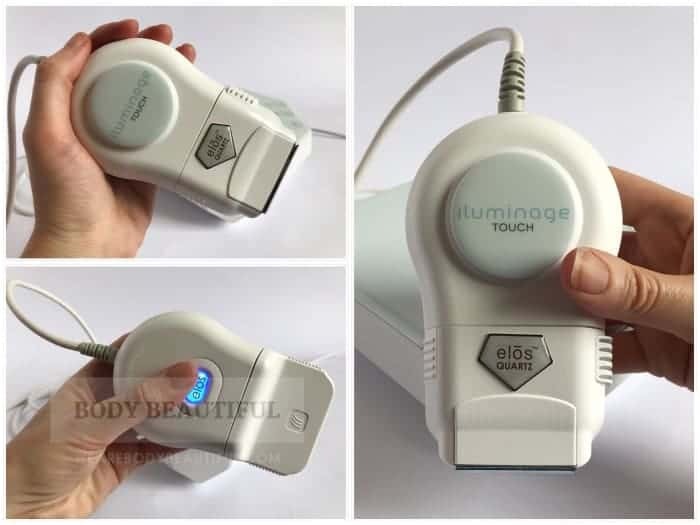 Loads love how easy the Iluminage Touch is to use, that it’s painless, compact and easy to store, and that underarms and bikini line take just minutes to do. Some even comment that a full body treatment is ‘fairly quick’ for them. Some reviewers love their devices but don’t share specific feedback on their experiences or results. Loads say it works, and their reviews come at varying stages from just a few treatments to a few months of use. Early reviews report promising results with varying degrees of hair reduction, patchy and finer regrowth and slowed growth rates. Reviews left after more than 6 weeks of treatments tell of the best results. There are a few reviews from users with darker skin tones, and just a couple with lighter hair too. 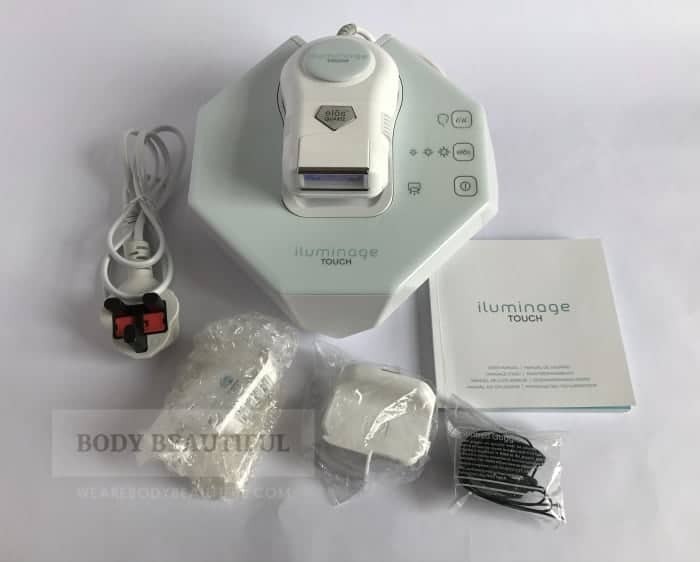 If you like the sound of the Iluminage Touch but want to treat just your face and small areas, the cost of this bad-boy can seem a bit too steep. Fret not. The Iluminage Precise Touch uses the same technology. It’s safe for dark and black skin tones and works on fair hair. It’s much smaller than the Touch. It’s a hand-held applicator (with no base unit) and has a small 2 cm² flash window. This is designed for use on the face and smaller areas. If you’re using it on smaller areas like forearms, bikini line, underarms and face I estimate you’ll get around 6 years of monthly maintenance treatments. It’s great value and it costs less then the Touch too. Your skin is dark or black, because it’s the only clinically proven safe for you. If you have fair hair it’s the only proven effective home IPL, but it takes a long time to see results. It’s a fine choice that gives great results. If your skin tone is light to medium, you can use higher power home machines becase they’re safe for your skin. They’ll likely give faster results. 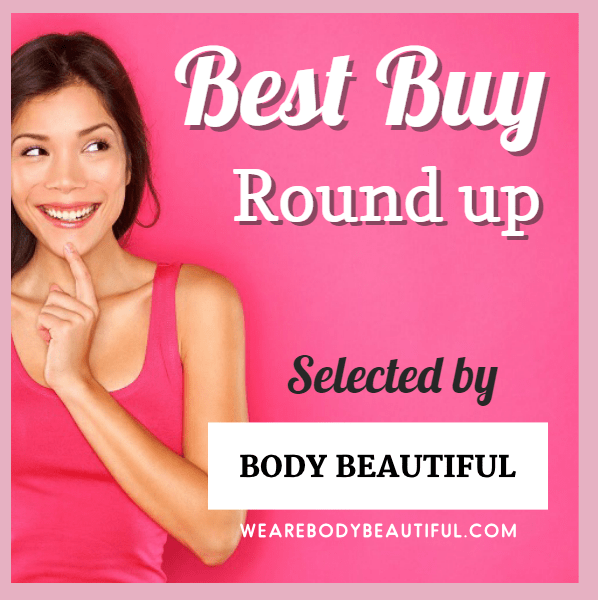 Check out the recommendations in the best buy roundup. 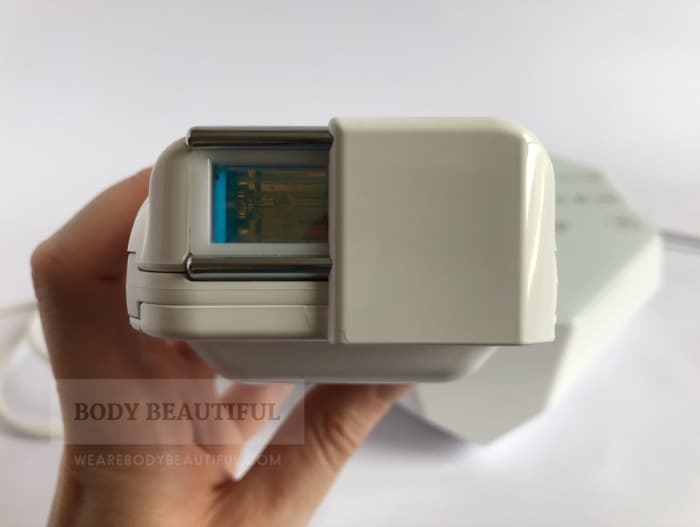 Overall I recommend the Philips Lumea Prestige for home IPL hair removal packed full of features, and the Tria 4X hair removal laser if you want maximum power. If you want power but with foolproof plug in-and-go simplicity then check out the Smoothskin Muse. This no-faff device selects the best intensity level for your skin tone before every flash. You can use it on medium dark skin tones too, but it’ll automatically select a lower intensity level. If your skin is dark but not the darkest, you should consider the Smoothskin Bare. It’s safe for darker skin because it operates at just one low intensity (3 J/cm²). This makes the flashes fats at every 0.6 seconds. A full leg’s done from around 4+ minutes! Ultrafast. The lower energy means it takes a bit longer to see results and you’ll need regular top up treatments to stay smooth. But if you have dark skin you’ll need a low intensity setting anyway. I really like this device for lighter skin tones too, because it’s so very fast and affordable. It’s a fantastic choice for those with a hectic schedule, or if your just a bit lazy and have trouble committing to the regular treatments. You can be done in under 10 minutes. I think it’s game-changer. To help you decide here’s a quick summary of the Iluminage Touch pros and cons. Should I buy the Iluminage Touch? Yes, this is the device for you if you have the darkest skin tones. And it’s the only device proven to work on fair hair too (you’ll need more treatments though). The Elōs technology makes it safe and effective. It stands out as an intuitive, easy and comfortable device to use. If you have the darkest skin tones you’ll use it on the lowest intensity levels so treatments are quick. And if the price of the machine plus a replacement cartridge is competitive when compared to other devices on your shortlist, then it’s a sound choice. It’s loads cheaper than professional treatments. If you have lighter skin tones and can use a higher intensity level then treatments with the Iluminage Touch are slow, so try the alternatives suggested above. You can check prices and buy the Iluminage Touch below. Buy from CurrentBody.com: UK, Europe and Australia, with Global shipping options. Buy from Amazon: UK, Europe, USA, Canada and Global shipping.